Tropical cyclones in this part of the Indian Ocean are not that rare. Most form in the central Indian Ocean, sufficiently far enough off the coast for some preparations to be made. Last year, the government received support from international donors for a disaster fund of $18.3m (£13.9m) for 2018 and 2019. This contingency plan is the main source of funding for any disaster response and is intended specifically for search and rescue within the first 72 hours. 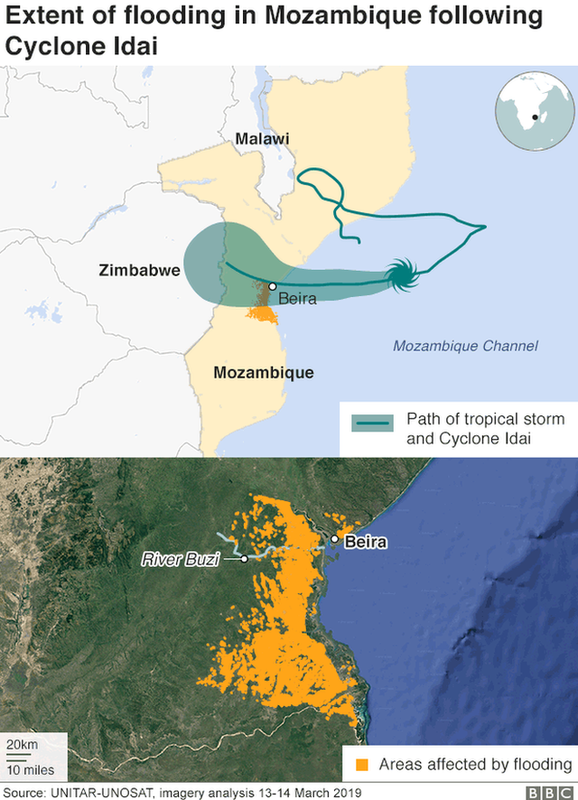 The meteorological office of Mozambique, Inam, issued weather alerts as the storm developed. Three days before the cyclone struck, the government raised the alert to the highest possible level, telling people to evacuate threatened areas. As part of the forward planning for severe weather, safe zones had been created in rural areas for evacuation above the flood plain. On this occasion, however, the flooding was far more severe than anticipated. Preparedness has focused on drainage systems, says Dinis Juizo, associate professor of hydrology at the University of Eduardo Mondlane in Maputo. Drainage canals and flood-control protection, such as a large water basin, have also been introduced. But Zimbabwe's Minister of Defence, Oppah Muchinguri, has said her government failed to anticipate its strength. By the time the storm reached Zimbabwe it had weakened considerably and was no longer a tropical cyclone.